Another type of instrument commonly seen in measurement and control systems is the process switch. The purpose of a switch is to turn on and oﬀ a device like heaters, motors, valves etc… with varying process conditions. Usually, switches are used to activate alarms to alert human operators to take special action or can be used to trip or in interlocks. In other situations, switches are directly used as control devices like there is level switch installed in a tank to prevent damage of a pump, pump will be automatically stopped/tripped when level reaches low in the tank. The “PSH” (pressure switch, high) activates when the air pressure inside the vessel reaches its high control point. The “PSL” (pressure switch, low) activates when the air pressure inside the vessel drops down to its low control point. Both switches feed discrete (on/oﬀ) electrical signals to a logic control device (symbolized by the diamond) which then controls the starting and stopping of the electric motor-driven air compressor. 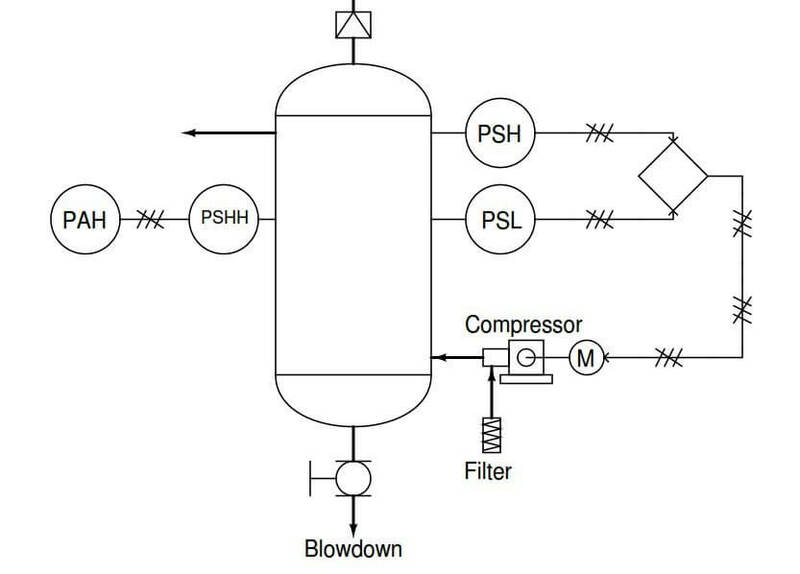 Another switch in this system labeled “PSHH” (pressure switch, high-high) activates only if the air pressure inside the vessel exceeds a level beyond the high shut-oﬀ point of the high pressure control switch (PSH). If this switch activates, something has gone wrong with the compressor control system, and the high pressure alarm (PAH, or pressure alarm, high) activates to notify a human operator. All three switches in this air compressor control system are directly actuated by the air pressure in the vessel: in other words, these are direct process-sensing switches allowing us to build on/oﬀ control systems and alarms for any type of process. The labels “AAL” and “AAH” refer to analytical alarm (analytical alarm or analyzer alarm) low and analytical alarm high, respectively. 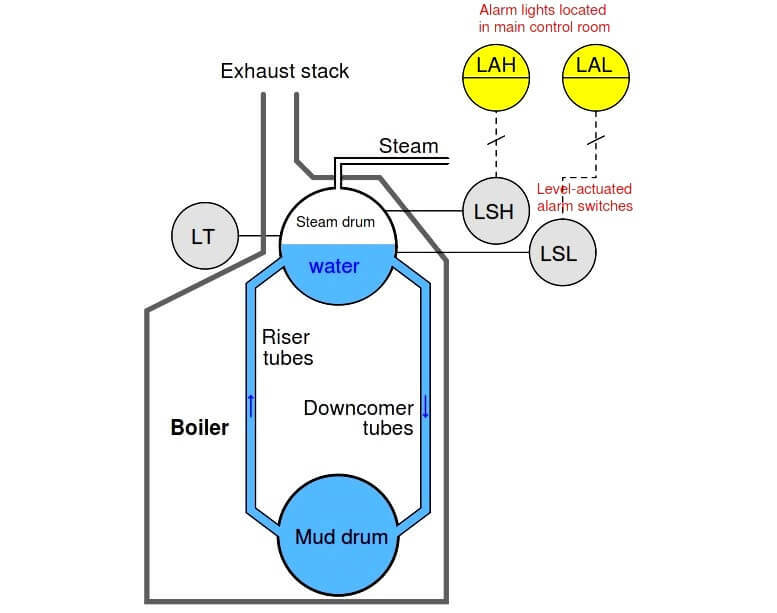 Note how the diagram shows these two alarm units connected to the electronic (420 mA) signal output by the chlorine analyzer (AT). This tells us the AAL and AAH alarm units are really just electronic circuits, alarming if the analytical transmitter’s 4-20 mA analog signal falls below (AAL) or exceeds (AAH) certain pre-set limits. As such, the AAL and AAH alarms do not directly sense the chlorine concentration in the water, but rather indirectly sense it by monitoring the chlorine analyzer’s 4-20 milliamp output signal. Since both alarms work oﬀ the 4 to 20 milliamp electronic signal output by the chlorine analytical transmitter (AT) rather than directly sensing the process, their construction is greatly simpliﬁed. If these were process-sensing switches, each one would have to be equipped with the analytical capability of directly sensing chlorine concentration in water. In other words, each switch would have to be its own self-contained chlorine concentration analyzer, with all the attendant complexity. In addition to providing alarm capability, this SPA module also provides a digital display (a small LCD screen) to show the analog signal value for operational or diagnostic purposes. 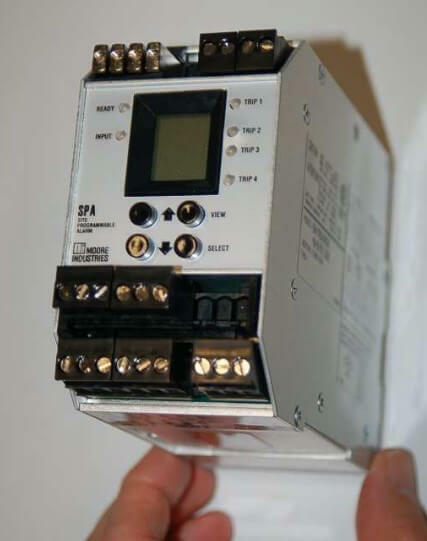 Like all current-operated alarm modules, the Moore Industries SPA may be conﬁgured to “trip” electrical contacts when the current signal reaches a variety of diﬀerent programmed thresholds. Some of the alarm types provided by this unit include high process, low process, out-of-range, and high rate-of-change. Note : The level transmitter signal can be used in soft program and can assign the low and high alarms i.e. LAL & LAH. These two switches serve as water level alarms, because the signal comes from the level transmitter, which outputs an signal in direct proportion to water level in the boiler’s steam drum. It should be mentioned that the choice between using process alarm switches directly actuated by the process versus alarm switches actuated by a transmitter’s analog signal is not arbitrary. In the system where the two alarm switches actuate from the transmitter’s output signal, the integrity of the water level control and that of the high- and low-level alarms all depend on the proper function of one transmitter. If that one transmitter were to fail, all three system functions would be compromised. This elevates the importance of a single instrument, which is generally not desirable from the perspective of reliability and process safety. 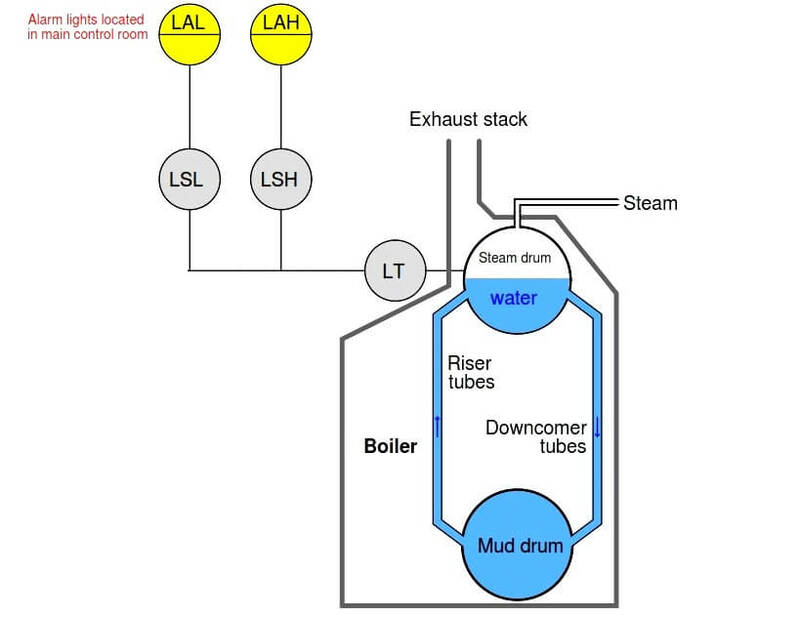 In the system where each level alarm switch independently senses steam drum water level, one device may fail without compromising either of the other two functions. This independence is desirable because it greatly reduces the probability of “common-cause” failures, where a single fault disables multiple system functions. The ﬁnal determination should be based on a rigorous analysis of device versus system reliability, which is typically the task of a process engineer. What is a Annunciator ?